I’ve been trying very hard not to write the cliche post about New Year’s Resolutions and eating healthier, yada yada yada. So I won’t. Instead, I’ll just give you two really great recipes that COULD help with such a resolution IF you had one. I’ve shared previously about how meal planning can change your life, and I truly stand by that statement today. When I meal plan for the week, everything just seems so much easier and healthier and less stressful. Yes, it is definitely harder on the front-end and does take time, but it is worth it. Trust me. One of my key tips is using Walmart Grocery Pickup – you place your order online, you drive to the store and they load it into your car for you. In this ridiculous weather we’ve been having, I don’t know how it gets much better than that. You know you want to try it, so take the first step – use this link to sign up for your first order and get $10 off. You’re welcome. After engorging ourselves in December, we’ve gone back to the everyday mason jar salads for lunch, and are really a hit. I’ve even started making my own salad dressing. It is divine and so much better than that store-made stuff. I’ve made a few varieties, but this one has been our favorite. Add all ingredients to a mason jar and shake to combine! It’s as simple as that. The next easy, life-changing recipe I want to share is crustless quiche. I first learned about it from my Mom early last year, and it is now a staple in our house. If we’re being good, we make some every Sunday for the week ahead. Cook the sausage, adding garlic when its almost/basically done. Whisk eggs with milk and S&P. Spray pan – we use 9.5″ circular glass pan. Spread sausage, spinach + tomatoes, then cover with egg mixture. Bake for approx. 30 minutes, until set. I then pre-cut slices of quiche, cover with foil and pop in the refrigerator. In the mornings, we take a piece, microwave it for about 35 seconds and top with some salsa verde. Yum! Any time I can find a new recipe that fits weeknight rotation criteria (namely, easy and semi-healthy), I consider it a win. In the last few weeks, I found TWO really delicious and easy dishes that Husband and I both love, so of course, I had to share. I love our crockpot year-round, but in the Fall I’m itching to use it even more. Sometimes I wish I had two crockpots so I could use one the next night without having to clean the one from the night before … but that would just promote bad behavior, so I resist and clean and stick to one crockpot meal a week. I was searching for new chicken crockpot recipes and happened upon this one. It’s very different than something we would typically do, but I’m so glad we tried it because it’s amazing. If you like Indian flavors and spices, you need to try this – simply mix the sauce on the stovetop, pour it over the chicken and heat on low for 6 hours. In a medium saute pan, heat coconut oil over medium heat. Add onion and sauté until translucent and fairly tender. Add garlic, spices, and salt. Cook 1 minute longer, till all the spices are fragrant and amazing. Stir in coconut milk and tomato paste and stir until well combined. Shred or dice chicken into the sauce, squeeze in lime juice, top with cilantro, and serve with your favorite vegetable or rice – we’ve been using quinoa! Fun fact about me – any time I’m staying in a hotel room, the TV will be on going back and forth between HGTV and Food Network. Since we cut cable, those are the two channels I miss dearly, so when I’m traveling (for work or vacation) I get so excited I’ll be able to watch from my cozy hotel bed. Last weekend we went to Hermann, Missouri for a little weekend getaway. It was time for me and Husband to reconnect, to drink wine and of course, relax. Sunday morning we woke up earlier than usual, so we turned on the fireplace, made some coffee and watched Ayesha’s Homemade on Food Network. I loved the show and loved all the dishes she made, but this one stood out and I vowed to make it. Well, I made it this week and it was a hit. It will be going in the weeknight rotation for sure. Halve the peppers through the stems; remove the stems, seeds and membranes. In a 9-by-13-inch baking dish, toss the peppers with 1 tablespoon of the olive oil and 1/2 teaspoon salt, then arrange the peppers cut-sides up. Set aside. Heat the remaining 3 tablespoons olive oil in a large skillet over medium heat. Add the turkey and cook, breaking it up, until no longer pink, about 3 minutes. Add the onions, and garlic and cook until the vegetables begin to soften, about 5 minutes. Season with the cumin, smoked paprika, 1/2 teaspoon salt and some pepper; stir to combine. Add the tomatoes, ketchup, mustard, brown sugar, vinegar and 3/4 cup water. Bring to a rapid simmer and cook until thickened, about 10 minutes. Spoon the filling into the pepper halves and sprinkle with the Cheddar. Pour 1/4 cup water into the bottom of the baking dish and tent with foil (so the foil is not touching the cheese). Bake until the peppers begin to soften, 20 to 25 minutes. Uncover and bake until peppers are very tender and the filling is browned and bubbly, another 15 to 20 minutes. I’ve said it once and I’ll say it again. Meal planning and cooking every single week is the worst. 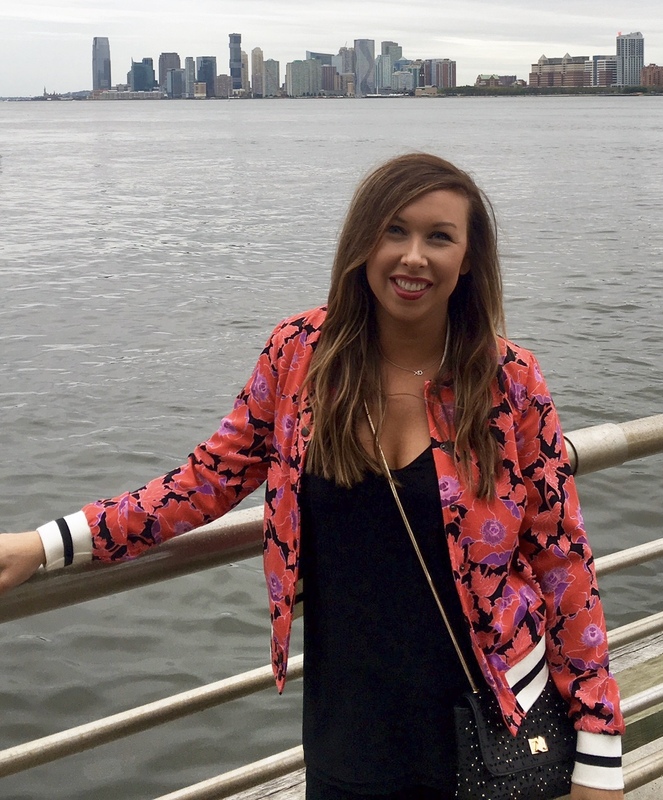 I used to dread dinner every night because I hadn’t planned ahead and didn’t know what we were going to eat until about 30 minutes before, which usually equated to eating out or eating unhealthy meals. Then, I got my act together. I started forcing myself to meal plan for the week ahead on Sunday afternoons. I plan, place my order on Walmart Grocery, then pick up! I don’t even have to get out of my car (which is even better for those often lazy Sundays). I shared some other meal planning tips here, but in this post I want to share some super simple and delicious recipes to add to your weekly meal repertoire. Who doesn’t love easy, mostly healthy, delicious recipes? And there is absolutely nothing wrong with re-using the same recipes again and again and again. If it’s not broken, don’t fix it. White Chicken Chili – Thanks to my coworker for sharing this one! We tried it this weekend and it was so delicious and easy. I think the surprise ingredient that took it to the next level was the Cream of Chicken Soup. We topped with jalapenos and shredded cheese. On a similar note, there’s always my classic chili or a good taco soup. These are perfect for Fall and serve a group of people for an easy meal together. Southwestern Stuffed Peppers – This is great with black beans and rice, but can also be paleo if you cut those two ingredients and cheese out of the recipe. As you’ll see in the recipe, I used to cut the peppers in half long ways, but now I just cut the top off and stuff it all in. We eat it with lots of delicious salsa and avocado. Crockpot Chicken Verde – We do this one a LOT because it’s so simple and versatile. Are you ready for the recipe? Put chicken in a crockpot and top with salsa verde. We prefer World Table Roasted Salsa Verde from Walmart. And that’s it! That’s all you do! Put it on low over lunch and it will be ready by dinner. This is great over rice, with veggies or in tacos. Make-Your-Own Quinoa Bowl – Lately I’ve been on a quinoa kick. Cook your quinoa on the stove or in the rice cooker, then add whatever you want. I literally pull all options out of the refrigerator and Husband and I fix how we like. He tends to go towards mexican-style – beans, chicken, salsa, cheese. I tend towards mediterranean – banana peppers, kalmata olives, tomatoes, arugula and a delicious greek tzaziki dip I found at Walmart. What’s great is this is also perfect to pile into a mason jar and take to work for lunch. One-Pan Balsamic Chicken – This one is super healthy and pretty much paleo – chicken, asparagus and tomatoes. You could mix the sauce up a little bit if you prefer more sweet or more spicy, but overall very easy (one-pan!) and delicious. We make this every other week. Greek Pork Chops with Squash and Potatoes – This one is our new favorite! I found it in Southern Living, and every time I make it Husband comments how good it is. Again, one-pan! Sometimes we use potatoes, sometimes we just stick to squash and zucchini. Pepperoni Rolls – Okay this one is totally unhealthy and we do not make it often, but it is so so good. This would be a great alternative to ordering pizza one night or is perfect as a heavier appetizer for a party. We put jalapenos in ours and serve with warm marinara as dipping sauce. What is your easy go-to recipe? Often I get in moods to bake. Sometimes I get in moods to cook. Rarely I get in moods to meal plan. This weekend I did all three, and I’m so glad I did. Mostly the last one. Keep reading and you’ll see why. Pumpkin bread is one of my favorite things and I typically make it every fall. I posted a recipe here last year. This year I tried a new recipe and added mini chocolate chips. Turned out fine, not great, but it kept my idle hands busy, and now I have a loaf to share with some friends later this week. Next up was dinner. Of course we had no food, and of course I didn’t want to go to the grocery store. (Reminder: it was 40 degrees and raining!!) I decided to raid the pantry and refrigerator and force something to work. I found half a box of pasta and chicken in the freezer … but no sauce. Then it hit me. How do you make alfredo sauce? It can’t be that hard, right? Or have that many ingredients, right? Y’all. I’m never buying jar alfredo sauce AGAIN. Okay, I never bought it in the first place, because I’m not really an alfredo fan, but seriously, now I am. It was SO easy, and SO delicious. Meal planning for the week is the worst. Can I get an amen?? It just seems so difficult to decide what to eat for dinner every single night. And cook it. And clean it up. And do it all over again the next week. Well, husband had a great idea. Write down all of our recipes on index cards, then each Sunday choose from the stack for the week, add all ingredients to Walmart Pickup-Grocery (seriously, life changing) and that’s it! I spent several hours Sunday going through recipes on my blog, on Pinterest and cookbooks. I wrote the name and ingredients on one side, and the location of the recipe on the back. Maybe someday I’ll write the full recipe on there, but this was a good start. I also added asterisks to the top right of foods that are whole 30 approved. You could even take this one step further and pin it somewhere in the kitchen so the whole family can see what’s for dinner for the week. I love this idea, and I think it will make meal planning so much easier, and the great thing is, I can keep adding to my index cards when I find more recipes I enjoy! Do you have tips for meal planning? Or a favorite recipe you want to share, so I can add it to a card? Whole30: a month-long clean eating program similar to Paleo diet (low carb, high protein), stripping away hormone-unbalancing, gut-disrupting, inflammatory food groups, considered to be grains, sugar, dairy, alcohol, and legumes. Last night I was tempted by Mellow Mushroom Pizza and two different kinds of homemade cake, and I did not give in! I’ll take a pat on the back now, please. That being said, this has definitely been the easiest diet I’ve ever done. I’m 7 days in and can honestly say I haven’t been hungry once. I’m eating enough to satisfy my body, but not overindulging which is so easy to do with unhealthy foods. It’s a lot easier to not indulge when your only options to eat are meat, veggies and fruit. They taste great, but I’m not going to eat 3 bowls of salad. Let me back up for a second – why am I doing this? Husband and I have been talking a lot lately about doing some sort of healthy eating re-start. We are only 2 months out from our European vacation, and I wanted to lose some weight and eat better, so that I can indulge on the trip and feel less guilty about it! Mom gave me the book It Starts With Food and it was fascinating. After the first chapter I was convinced this is what we needed to do instead of some ridiculous juice cleanse. The program touts higher energy, better sleep, reduction of cravings and even helping with some chronic issues, which for me is headaches, and you’re eating REAL FOOD. – Since it’s super strict, you know what you can and can’t eat. There’s no guessing, which makes it easier. – The food is delicious! There are some amazing recipes on Pinterest. – I can honestly say I’m already starting to feel better, and eating healthier makes me want to exercise more, which gives me more energy. – It’s harder to eat out, so we’re saving money by staying in. – You have to plan, and cook a LOT, so it’s very time-consuming. – Did I mention you have to really plan? And cook every night? Breakfast: I’ve been eating fruit and almond butter, Husband’s been eating eggs and sometimes canadian bacon, and we’re drinking (black) coffee. There’s no way I could give that up. 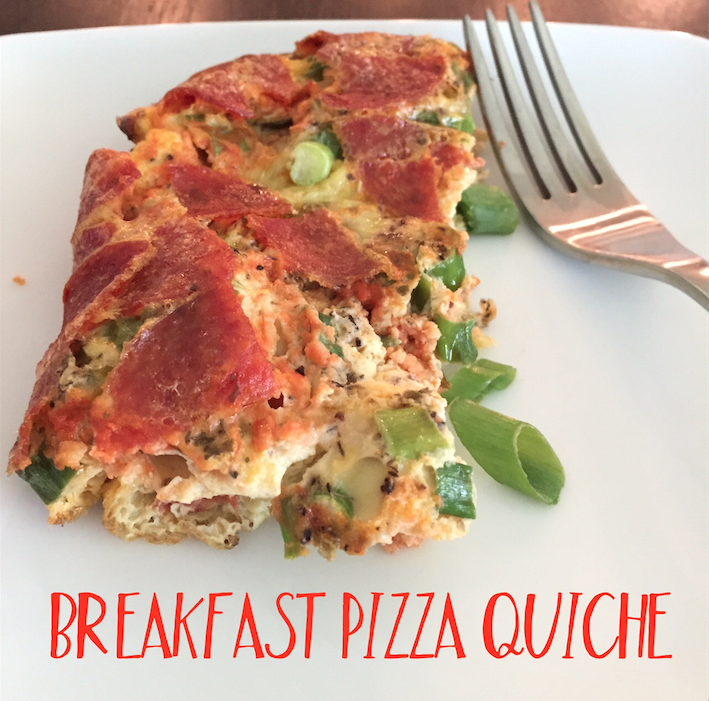 Saturday we tried a new recipe with this Breakfast Pizza Quiche I found on Pinterest. The site claimed it would take away your pizza cravings – HA, not exactly, but it was pretty good. We’ll definitely make it again with a few ingredient changes. Lunch: I pretty much eat salad every day, which gets kind of boring, but it’s not bad. 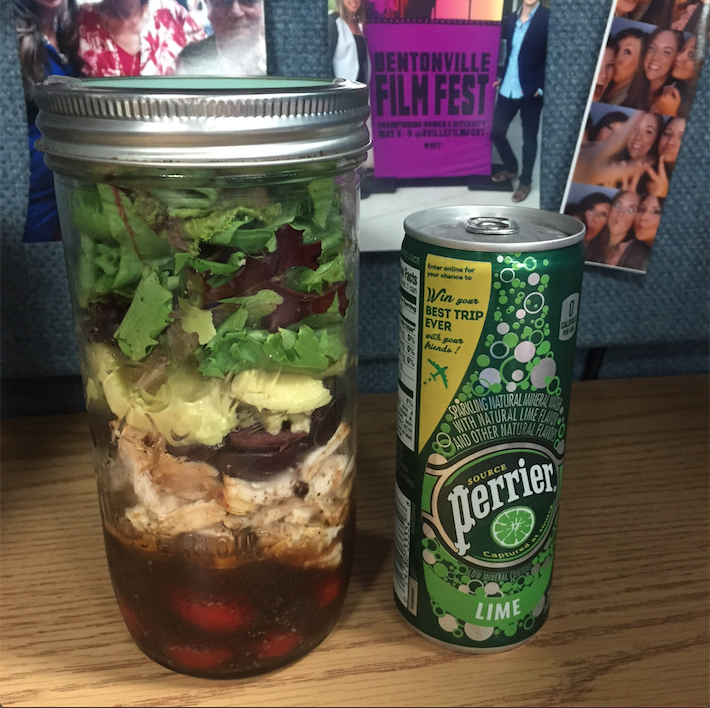 My mason jar salads make it a little more fun. Dinner: Dinner is the hardest since by the end of the day the last thing I want to do is to cook. We’re still building up our easy Whole30 compliant recipe collection. 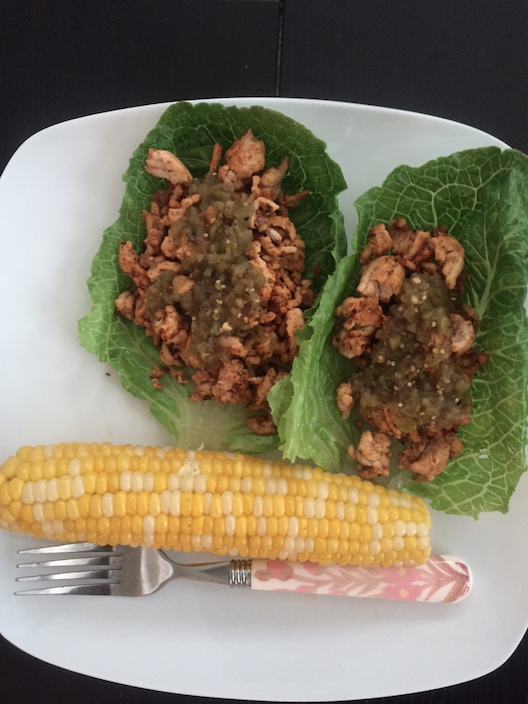 My favorite thing we made this week was these lettuce wraps with ground turkey, spices, and salsa. Also, huge shoutout to our friends the Hotarys who had us over for dinner and made an amazing Whole30 meal! Well onward we go into the second week! Keep us in your thoughts, share your recipes and pleeease don’t offer me any chocolate.